I almost always eat breakfast in the office. I don’t really have time at home in the morning, and I catch a train to work so my early morning schedule is unforgiving. I find it easier to get to work half an hour early and fit breakfast into that half an hour. Plus if I eat breakfast too early I get hungry way before elevenses. But then the problem arises – what can I take for breakfast that’s fairly quick and easy, doesn’t take too much cooking, and can be eaten with the minimum use of cutlery and crockery at my desk. Available equipment – one microwave, one kettle. I have eaten various weird and wonderful things for breakfast in the office over the years, in the name of finding something convenient and tasty to eat that isn’t too unhealthy, and have made a list of my favorites below. Some of them involve more preparation than others, and some involve more cooking once you have arrived at the office than others but there should be something that suits you! Cereal and yogurt – take the yogurt in a plastic box and the cereal in a zip-lock bag. In the office, tip the cereal into the yogurt. If you add the cereal before you leave the house it will probably go soggy. Variations: add some fresh berries to the yogurt – strawberries, raspberries or blueberries, or some chopped papaya or pineapple. Any amount of fresh fruit or smoothies, either pre-prepared or make your own the night before, together with a hard boiled egg for some protein. A sandwich – more of a lunch food perhaps but nice once you get used to it. Try cottage cheese and smoked ham, or bacon, lettuce and tomato (BLT). Use granary bread so it fills you up for the morning. Porridge. Take a plastic box with the oats and sugar in. Take a plastic bottle with the right amount of milk in (an old smoothie bottle is good). In the office, pour the milk into the oats, in the box, and cook it in the microwave for 2 or 3 minutes until it’s the desired consistency. 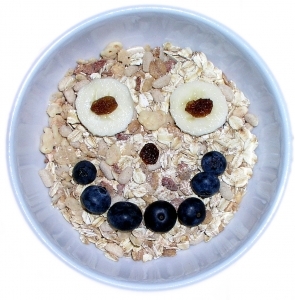 Do keep an eye on it – you don’t want exploding porridge all over the office microwave. Scrambled egg – can be made easily in the office microwave. Take two eggs to work and then use a bit of the office milk as well. Take a wholemeal pitta with you to serve it in as this reduces any mess involved. Leftovers from the night before – a frittata or omelette will go down nicely for breakfast and can be reheated in the microwave or eaten cold. Soup of some kind. I appreciate this is not to everyone’s taste, but a warm meat and vegetable soup first thing on a cold morning is great. Either take in a thermos flask or heat in the microwave. Or do a cup a soup using the kettle. A bread roll and a banana. For some reason this was my standard breakfast for years. I pass a supermarket and would walk in, grab a roll and a banana, and be on my way in 2 minutes. Sometimes I would substitute a seeded bagel for the bread roll. A muffin from Starbucks. Not too often though. They do a nice morning bran muffin with dried fruit and pine nuts which although is still quite high in sugar, probably compares favorably to some breakfast cereals. A cereal bar, a Muller light yogurt, and a piece of fruit. Another breakfast that is easy to grab from the shop on the way to work. Anything where the smell will permeate the office after you’ve heated it up – fish pie or kedgeree is a prime example. Leftover cake from the office kitchen. Really, not a good habit to get into. Fast food – KFC or McDonalds say. Again, everyone else will smell it and want some, and it’s a bad habit to cultivate! What are your top tips for a quick and easy breakfast on the go?